A couple of months ago my life seemed, with melodramatic-laced torment, to be spiralling out of control. In an attempt to combat this and impose some self-constructed order on the arbritrariness of everyday living I wrote a list of twenty-five things that I would have to have done by the end of next year. Already, nine have been crossed off. Some events have occurred that have been so momentous that I did not even think to put them on this list, as my dreams did not stretch that far (a failure of mind-elasticity on my part, I think). And so I added them, just to have the pleasure of crossing them off. Now, I am adding this. 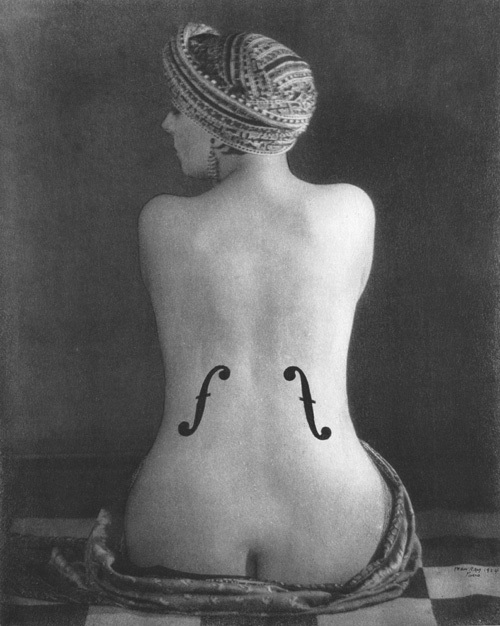 Violon d’Ingres, Man Ray, 1924. One day, inked on my back.